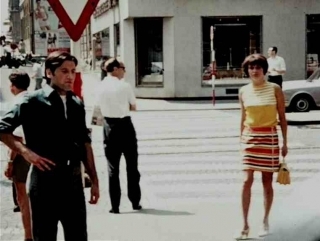 The Essential Frame is a brief introduction to Austrian independent filmmaking, focusing on those artists for whom the material and mechanics of cinema are fundamental to the form and content of their work. Perhaps more than any other national avant-garde cinema, the Austrian filmmakers have paid particular and precise attention to the frame – and it goes two ways – into the frame (and the space between two adjacent frames) as the essential component of film (and apparent motion), and outwards, testing the limits of the frame, pushing the boundaries of expanded cinema and film actions. From the personal to the universal and from the sublime to the explicit, many of the films extend Austria’s history of radicalism in painting, architecture, literature, music and philosophy. These two programmes include the early pioneers such as Peter Kubelka, Kurt Kren, Marc Adrian, Valie Export and Moucle Blackout, and contemporary artists including Martin Arnold, Dietmar Brehm, Lisl Ponger and Peter Tscherkassky.